"VIN" redirects here. For other uses, see Vin (disambiguation). "VINs" redirects here. For the non-profit organization, see Vermont Institute of Natural Science. For the Russian Baptist pastor, see Vins. VINs were first used in 1954 in the United States. From 1954 to 1981, there was no accepted standard for these numbers, so different manufacturers used different formats. In 1981, the National Highway Traffic Safety Administration of the United States standardized the format. It required all on-road vehicles sold to contain a 17-character VIN, which does not include the letters I (i), O (o), and Q (q) (to avoid confusion with numerals 1 and 0). There are at least four competing standards used to calculate the VIN. Modern VINs are based on two related standards, originally issued by the International Organization for Standardization (ISO) in 1979 and 1980: ISO 3779 and ISO 3780, respectively. Compatible but different implementations of these ISO standards have been adopted by the European Union and the United States, respectively. World manufacturer identifier Indication of "the general characteristics of the vehicle" Indication that provides "clear identification of a particular vehicle"
World manufacturer identifier 9 Indication of "the general characteristics of the vehicle" Indication that provides "clear identification of a particular vehicle"
The first three characters uniquely identify the manufacturer of the vehicle using the world manufacturer identifier or WMI code. A manufacturer who builds fewer than 1000 vehicles per year uses a 9 as the third digit, and the 12th, 13th and 14th position of the VIN for a second part of the identification. Some manufacturers use the third character as a code for a vehicle category (e.g., bus or truck), a division within a manufacturer, or both. For example, within 1G (assigned to General Motors in the United States), 1G1 represents Chevrolet passenger cars; 1G2, Pontiac passenger cars; and 1GC, Chevrolet trucks. The Society of Automotive Engineers (SAE) in the U.S. assigns WMIs to countries and manufacturers. The first character of the WMI is the region in which the manufacturer is located. In practice, each is assigned to a country of manufacture, although in Europe the country where the continental headquarters is located can assign the WMI to all vehicles produced in that region (Example: Opel/Vauxhall cars whether produced in Germany, Spain, the United Kingdom or Poland carry a WMI of W0L because Adam Opel AG is based in Rüsselsheim, Germany). The fourth to ninth positions in the VIN are the vehicle descriptor section or VDS. This is used, according to local regulations, to identify the vehicle type, and may include information on the automobile platform used, the model, and the body style. Each manufacturer has a unique system for using this field. Most manufacturers since the 1980s have used the eighth digit to identify the engine type whenever there is more than one engine choice for the vehicle. Example: for the 2007 Chevrolet Corvette, U is for a 6.0-liter V8 engine, and E is for a 7.0 L V8. One element that is fairly consistent is the use of position nine as a check digit, compulsory for vehicles in North America and China, and used fairly consistently elsewhere. The 10th to 17th positions are used as the 'vehicle identifier section' (VIS). This is used by the manufacturer to identify the individual vehicle in question. This may include information on options installed or engine and transmission choices, but often is a simple sequential number. In North America, the last five digits must be numeric. One consistent element of the VIS is the 10th digit, which is required worldwide to encode the model year of the vehicle. Besides the three letters that are not allowed in the VIN itself (I, O and Q), the letters U and Z and the digit 0 are not used for the model year code. The year code is the model year for the vehicle. The year 1980 was encoded by some manufacturers, especially General Motors and Chrysler, as "A" (since the 17-digit VIN was not mandatory until 1981, and the "A" or zero was in the manufacturer's pre-1981 placement in the VIN), yet Ford and AMC still used a zero for 1980. Subsequent years increment through the allowed letters, so that "Y" represents the year 2000. 2001 to 2009 are encoded as the digits 1 to 9, and subsequent years are encoded as "A", "B", "C", etc. The make may only be identified after looking at positions one through three and another position, as determined by the manufacturer in the second section or fourth to eighth segment of the VIN. In order to identify the exact year in passenger cars and multipurpose passenger vehicles with a GVWR of 10,000 or less, one must read position 7 as well as position 10. For passenger cars, and for multipurpose passenger vehicles and trucks with a gross vehicle weight rating of 10,000 lb (4,500 kg) or less, if position seven is numeric, the model year in position 10 of the VIN refers to a year in the range 1980–2009. If position seven is alphabetic, the model year in position 10 of VIN refers to a year in the range 2010–2039. The model year for vehicles with a GVWR greater than 10,000 lb (4,500 kg), as well as buses, motorcycles, trailers and low-speed vehicles, may no longer be identified within a 30-year range. VIN characters 1–8 and 10 that were assigned from 1980–2009 can be repeated beginning with the 2010 model year. 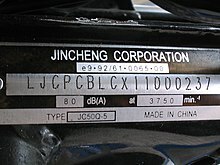 Compulsory in North America and China is the use of the 11th character to identify the factory at which the vehicle was built. Each manufacturer has its own set of plant codes. In the United States and China, the 12th to 17th digits are the vehicle's serial or production number. This is unique to each vehicle, and every manufacturer uses its own sequence. 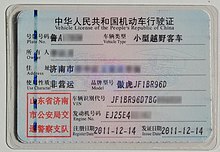 A check-digit validation is used for all road vehicles sold in the United States and Canada. When trying to validate a VIN with a check digit, first either (a) remove the check digit for the purpose of calculation or (b) use a weight of zero (see below) to cancel it out. The original value of the check digit is then compared with the calculated value. If the calculated value is 0–9, the check digit must match the calculated value. If the calculated value is 10, the check digit must be X. If the two values do not match (and there was no error in the calculation), then there is a mistake in the VIN. However, a match does not prove the VIN is correct, because there is still a 1/11 chance that any two distinct VINs have a matching check digit: for example, the valid VINs 5GZCZ43D13S812715 (correct with leading five) and SGZCZ43D13S812715 (incorrect with leading character "S"). The VINs in the Porsche image, WP0ZZZ99ZTS392124, and the GM-T body image, KLATF08Y1VB363636, do not pass the North American check-digit verification. Transliteration consists of removing all of the letters, and replacing them with their appropriate numerical counterparts. These numerical alternatives (based on IBM's EBCDIC) are in the following chart. I, O, and Q are not allowed in a valid VIN; for this chart, they have been filled in with N/A (not applicable). Numerical digits use their own values. S is 2, and not 1. There is no left-alignment linearity. The following is the weight factor for each position in the VIN. The 9th position is that of the check digit. It has been substituted with a 0, which will cancel it out in the multiplication step. The VIN's value is calculated from the above transliteration table. This number is used in the rest of the calculation. Copy the weights from the above weight factor table. The products row is the result of the multiplication of the vertical columns: Value and Weight. The products (8, 28, 48, 35 ... 24, 16) are all added together to yield a sum, 351. The remainder is the check digit. If the remainder is 10, the check digit is X. In this example, the remainder is 10, so the check digit is transliterated as X. With a check digit of X, the VIN 1M8GDM9A_KP042788 is written 1M8GDM9AXKP042788. A VIN with straight-ones (seventeen consecutive 1s) has the nice feature that its check digit 1 matches the calculated value 1. This is because a value of one multiplied by 89 (sum of weights) is 89, and 89 divided by 11 is 8 with remainder ​1⁄11; thus 1 is the check digit. This is a way to test a VIN-check algorithm. VINs may be optically read with barcode scanners or digital cameras, or digitally read via OBD-II in newer vehicles. There are smartphone applications that can pass the VIN to websites to decode the VIN. The Society of Automotive Engineers (SAE) assigns the WMI (world manufacturer identifier) to countries and manufacturers. The following list shows a small selection of world manufacturer codes. ^ a b "Vehicle Identification Numbers (VINs)". National Highway Traffic Safety Administration (NHTSA). Retrieved 2011-07-24. ^ "eCFR – Code of Federal Regulations – Title 49: Transportation – PART 565—VEHICLE IDENTIFICATION NUMBER (VIN) REQUIREMENTS". www.ecfr.gov. Retrieved 2013-04-09. ^ "ComLaw Legislative Instruments – Vehicle Standard (Australian Design Rule 61/02 – Vehicle Marking) 2005 (ADR 61/02)". Comlaw.gov.au. Retrieved 2010-09-27. ^ "United States Federal VIN Requirements (Title 49, Chapter V, Part 565)". Access.gpo.gov. Archived from the original on 2010-05-27. Retrieved 2010-09-27. ^ a b "Directive 76/114/EEC - Automotive - Enterprise and Industry". European Commission. Archived from the original on 2013-09-30. Retrieved 2013-07-08. ^ a b "ISO 3780:2009 Road vehicles – World manufacturer identifier (WMI) code". ISO. 2009-10-05. Retrieved 2010-09-27. ^ a b c d e f g h i j k l m n o p q r s t u v w x y z aa ab ac ad ae af ag ah ai aj ak al am an ao ap aq ar as at au av aw ax ay az ba bb bc bd be bf bg bh bi bj bk bl bm bn bo bp bq br bs bt bu bv bw bx by bz ca cb cc cd ce cf cg ch ci cj ck cl cm cn co cp cq cr cs ct cu cv cw cx cy cz da db dc dd de df dg dh di dj dk dl dm dn do dp dq dr ds dt du "List of manufacturers of motor vehicles and their trailers - numerical - SV 3.2" (PDF). Germany: Kraftfahrt-Bundesamt. 2018-01-15. Retrieved 2019-01-08. ^ "Re: VIN Information pursuant to 49 CFR 565.7 KOENIGSEGG" (PDF). US: National Highway Traffic Safety Administration. 2008-03-14. Retrieved 2019-03-13. ^ a b c "Revision to General Motors' Vehicle Identification Number decoding for 2016 Model Year" (PDF). US: National Highway Traffic Safety Administration. 2015-01-12. Retrieved 2019-03-13. ^ "Importing vehicles without a 17 character VIN". NEVDIS. Wikimedia Commons has media related to Vehicle Identification Number.